This is the second of four dishes that I learned to make during my 4-hour cooking class at BaiPai Cooking School in Bangkok, Thailand. This is the fourteenth post in the Thailand! travel series of my eats in Bangkok. Scroll to the bottom of the post to see other posts in this series. When Bryan first found out he had to go to Thailand for a work trip, he thought he would starve. 2) Thai food is full of coconut milk. Now, there are some elements of truth to some of his impressions. Coconuts are native to Thailand and coconut cream and milk are fundamental elements in many Thai dishes. Furthermore, Thai cuisine is all about the perfect balance of spicy, sweet, salty, and sour. This means “sweet” is inevitably one of those elements. However, there are so many dishes in Thailand that don’t fall neatly into one of those two categories. Thai food is extremely rich and diverse, incorporating influences from many different regions. After arriving in Thailand, we both immediately fell in love with Isaan cuisine, the food from the Northern part of Thailand next to Laos. Certain things make this region’s food particularly appealing to Bryan. First of all, you just don’t see the coconut milk based curries. It’s not really a predominant part of Isaan cuisine. This works quite well for Bryan, who can’t really tolerate coconut milk. Secondly, the food is extremely spicy, which Bryan loves. The higher level of spice successfully balances out the salty, sour, and – yes, even sweet – aspects of a particular dish. Bryan didn’t mind the slight sweetness in dishes we had in Thailand, and I think it’s because everything was so balanced it didn’t really stick out. Maybe in the US Thai restaurants have to tone down the spice and increase the sugar, which messes with the perfect balance? In any event, one of my favorite Isaan dishes (up there with Som Tam, the pounded green papaya salad), is Larb Gai. 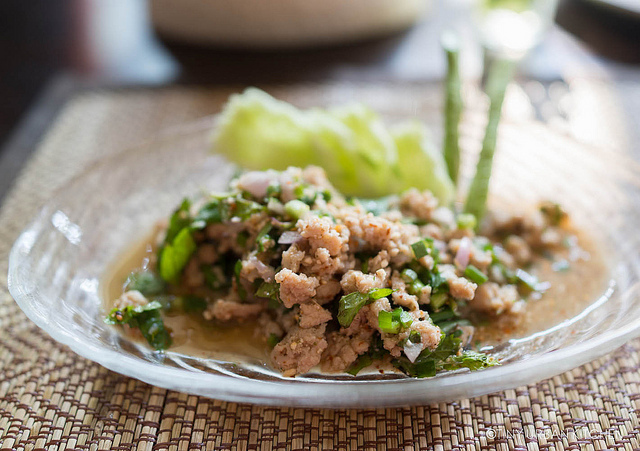 Also known as lop gai, lap gai, or laab gai (“larb” rhymes with “saab”), this refreshing salad is made with ground chicken, roasted rice powder, lime juice, fish sauce, and a load of gorgeously fragrant herbs, such as cilantro, mint, scallions, shallots, galangal, and kaffir lime leaves. It’s healthy, exploding with flavor, and just about the perfect mix of sweet, spicy, salty, and sour. One of the key ingredients in this dish is the roasted rice powder that gets mixed together with all the other flavorful ingredients. In our class, the instructor showed us how to toast our own in a wok. She did mention that you could also do this in the oven if you want to make this in bulk. Over high, dry heat, toss a 1:1 mixture of jasmine rice and sticky rice in a wok with fresh kaffir lime leaves and chopped galangal. Continue to mix until the rice is golden brown and the leaves begin to dry out. Grind in a mortar and pestle until it becomes a fine powder. You can also use a spice blender or food processor. Over medium heat in a pan, cook the ground chicken in chicken broth and salt until the chicken is cooked. Break apart the ground meat while cooking. Because we don’t want to heat the lime juice (it becomes bitter), remove the pan from heat and add fish sauce, lime juice, sugar, chili powder, and the roasted rice powder. Mix well. Mix in the shallots, cilantro, scallions, and mint leaves and toss together. Serve with raw fresh vegetables, such as long beans or cucumbers. Optionally serve with sticky rice. Please note that the portions we made in our class were single sized portions, so I would most definitely double or quadruple the recipe if you want to make it for more people. I actually think this dish is reasonably flexible, and the amounts of herbs you add are pretty much based on personal preference. Cook chicken with salt and chicken stock on a wok until chicken is cooked. Remove the wok from heat and add fish sauce, lime juice, sugar, chili powder, roasted rice powder. Mix well. Add fresh herbs! Shallots, cilantro, scallions, mint leaves, and toss. Serve with raw vegetables like cucumbers, raw long beans, and Chinese cabbage. Heat on medium high heat in a dry wok (or oven) until leaves begin to dry out and rice begins to brown.Grind by hand in a mortar and pestle until fine. This is the fourteenth post in the Thailand! travel series of my eats in Bangkok. Other posts include Thip Samai, Best Pad Thai in Bangkok? and Raan Jay Fai, Best Drunken Noodle in Bangkok, Maeklong Railway Market, Floating Markets (Damnoen Saduak), Street Foods of Bangkok, Part I, and Street Foods of Bangkok, Part II, and Fun Fruits in Thailand plus posts about recipes from my cooking class at Somphong Thai Cooking School including Som Tam (Papaya Salad), Thai Panaeng Curry Chicken, Bananas In Golden Syrup, BaiPai Thai Cooking School, and Golden Bags. I have made larb (with beef and pork) but not chicken. I loved the flavors and this reminds me to make it again. I love Thai food.